In March, the North Carolina Legislature went into special session and passed House Bill 2 in a single day. This legislation targets lesbian, gay, bisexual, and transgender, or LGBT, people for discrimination. Within hours of the bill’s passage, Gov. 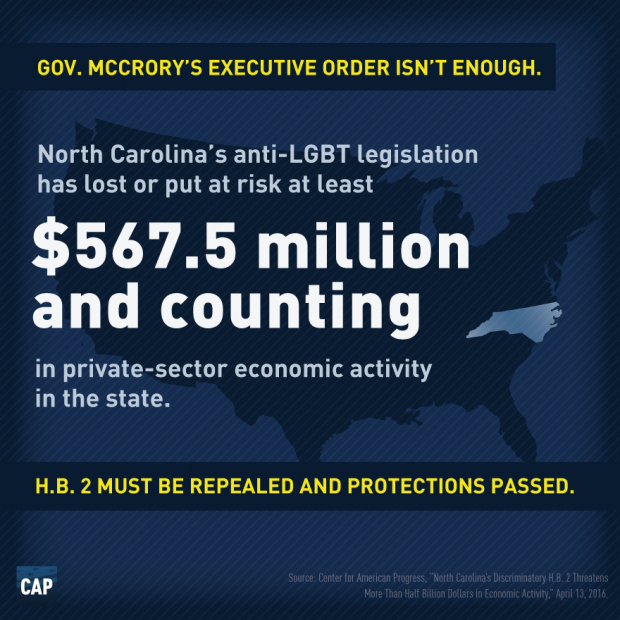 Patrick “Pat” McCrory (R) signed it into law, giving North Carolina the dubious distinction of enacting what some are calling the most anti-LGBT legislation ever passed. H.B. 2 was introduced in response to the city of Charlotte’s passage of an LGBT-inclusive nondiscrimination ordinance, following the lead of roughly 200 other localities across the country. Specifically, H.B. 2 rescinds LGBT nondiscrimination protections passed by Charlotte and several other North Carolina cities, bans them from passing future protections, and requires all government facilities in the state, including schools, to bar transgender people from using restrooms in accordance with their gender identities. In response, businesses quickly announced their opposition. More than 130 business leaders from across the country signed a letter to Gov. McCrory stating that H.B. 2 will “diminish the state’s draw as a destination for tourism, new businesses, and economic activity.” The NBA expressed concern over what it called a “discriminatory law” and indicated that it may move the 2017 All-Star Game and weekend out of the state. On April 5, PayPal announced the withdrawal of plans for a new global operations center in North Carolina, which was expected to bring 400 skilled jobs to the state. Recently, Gov. 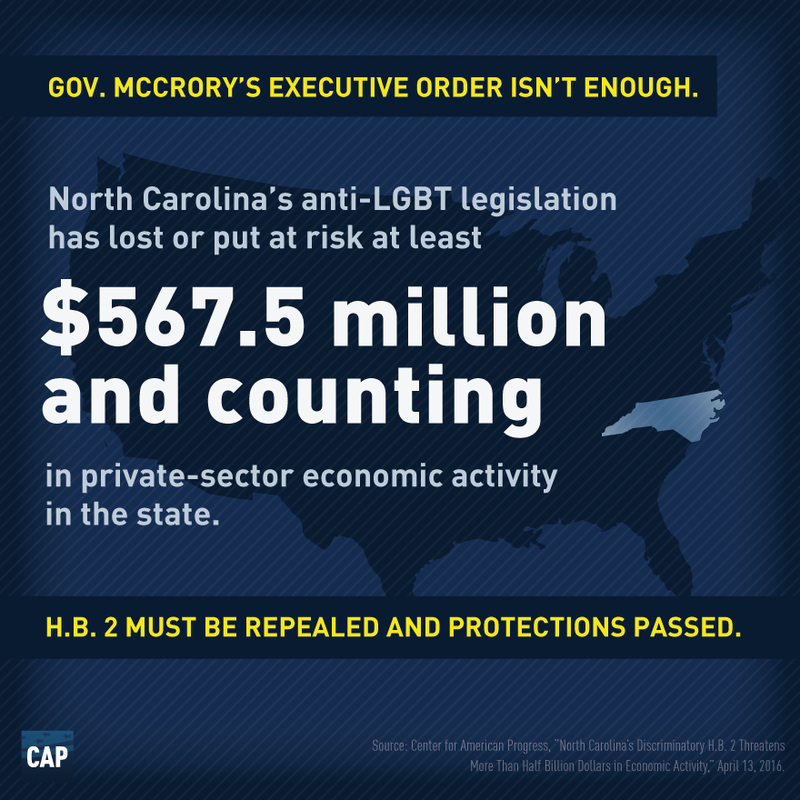 McCrory released an executive order banning anti-LGBT discrimination for state employees. The order, however, does nothing to address the most harmful components of H.B. 2, such as leaving municipalities without protections throughout daily life and continuing to ban transgender people from restrooms that correspond with their gender identity, including the very same state employees McCrory now claims to protect. The only way for the state to regain its economic footing and restore its image is to repeal H.B. 2 in full and pass comprehensive LGBT nondiscrimination protections. Based on publicly available estimates of the economic impact of lost or at-risk business activity or events, the North Carolina economy could potentially lose out on more than $567.5 million in private-sector economic activity through 2018. Note: Some estimates of economic impact are based on similar events in other states or in previous years. These totals do not include several entities that have announced that they will not do business in North Carolina but do not currently have events or work planned in the state. 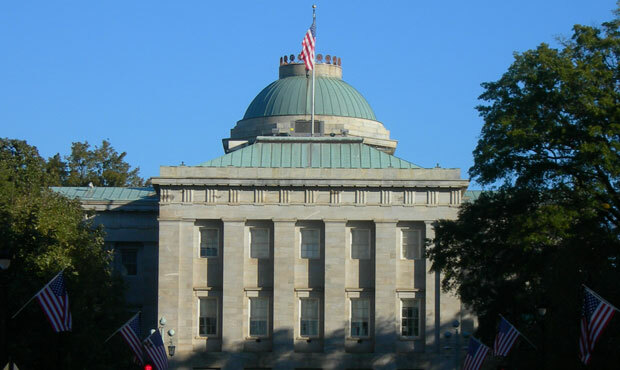 Major television studios, including Fox, A+E Studios, and Turner Broadcasting, have announced that they will not consider North Carolina for future filming if the law is not repealed. Two projects by A+E and Turner that are currently filming in North Carolina are expected to have direct in-state spending of more than $57 million. Google Ventures—an investment firm that manages $2.4 billion in assets—has pledged not to back any companies from the state; this is at a time when North Carolina’s emerging biotech and life sciences sector is ripe for investment. The public outcry from H.B. 2 comes roughly a year after Indiana passed an overly broad Religious Freedom Restoration Act before reversing course. The nationwide economic boycott of Indiana lost or put at risk more than $250 million for the state. The economic impact of discrimination as underscored by harmful legislation such as H.B. 2 is yet another reason why LGBT people need to be fully included in U.S. communities. Everyone deserves fair treatment under the law. Shabab Ahmed Mirza is a Research Assistant for the LGBT Research and Communications Project at the Center for American Progress. Sarah McBride is the project’s Campaigns and Communications Manager and Laura E. Durso is its Senior Director.